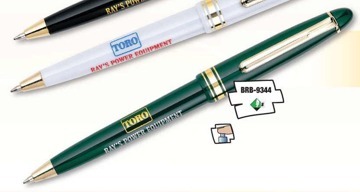 Promotional Classic Pens, Personalized in Bulk. Inexpensive, Budget Prices for USA, Canada. Bulk discount classic shape pens, Mont Blanc style, with gold trimming, jumbo refill and large imprint size. Superb quality for the price, lowest cost in USA, Canada for bulk customized classic pens. One of our bestsellers, available in many colors: same price. Prices include your 1-color custom imprint on barrel. You may also imprint on cap and on clip: contact us. Imprint Size: Large: 1 1/16" x 7/8" on Barrel.